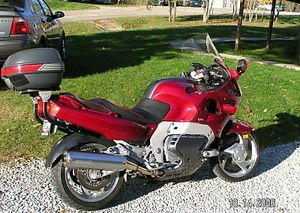 The Yamaha GTS1000A is a 1000cc, four cylinder, four stroke, street motorcycle in a grand touring design manufactured by Yamaha. 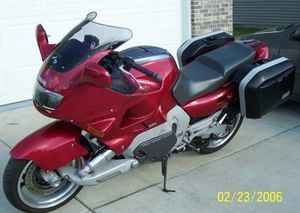 The 1993 model year saw the introduction of a bike heralded by some as the bike of the century. 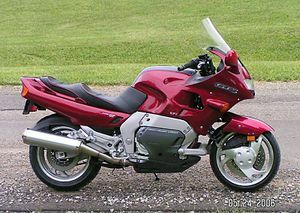 Yamaha produced one of the finest motorcycles ever built, the GTS-1000. It was a technological tour de force. 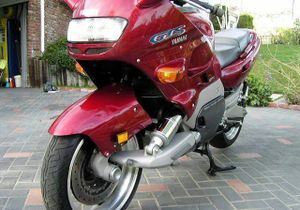 Yamaha's GTS-1000 featured the following technologies: RADD front suspension, Electronic fuel injection (Yamaha's first), ABS brakes (front and rear), a three-way catalytic converter, genesis-technology engine. 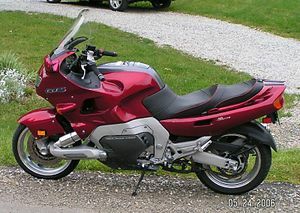 Yamaha called it Advanced Sport Touring, certainly the GTS-1000 is one of the most forward-thinking motorcycle designs ever. Central to the design is James Parker's RADD front suspension. RADD stands for Rationally Advanced Design; the system lives up to its name. RADD is a perfect example of racetrack technology coming to production motorcycles. The front suspension is similar to the double-wishbone suspension that has been found on race cars for many years. To accommodate the 90 degree twist on this older but effective idea, the lower swingarm is single-sided. 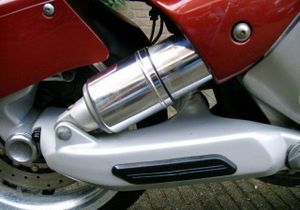 A telescopic steering shaft provides direct input from the front wheel to the handlebars. The front wheel hub is mounted on a spindle attached to a steering knuckle. Two ball joints are used to connect the steering knuckle to the upper and lower A-arms. The most significant effects of this design came from the fact that: traditional front forks compress over bumps, and during braking the fork tubes bind in their slides, while the wheelbase and caster angle changes, creating wobbles. The GTS-1000 has an anti-dive geometry and minimal bump steer designed into the front suspension. The use of ball joints minimizes frictional area and resultant binding, and all the suspension forces are channeled straight back to the rear swingarm. 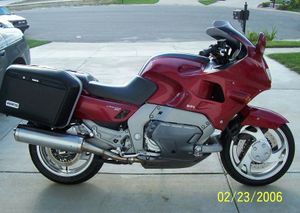 Compared to even the best motorcycle, the GTS-1000 feels more stable under braking and bumper corners. 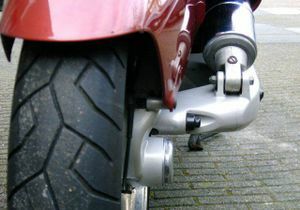 A dished front wheel allows the immense radially vented front rotor to be located on the center line of the vehicle. This leads to phenomenal braking (60-0 mph in 89 feet!) without the usual side-pull associated with other single-rotor front braking systems. 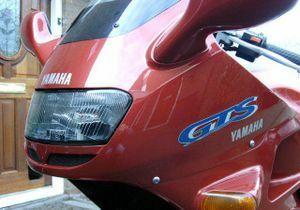 This GTS-1000 is equipped with Yamaha's excellent ABS. 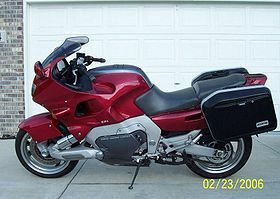 The Omega frame allows the use of the engine as a stressed member and is a rigid and light means for providing the pivot-points for the aluminum front and rear swing arms. The appearance of the assembly closely resembles that of the Greek letter Omega, hence the name. Subframe of steel tubing support the seat and steering head. The powerplant of the GTS is based on the FZR's 1002 cc, five valves per cylinder, water-cooled inline four Yamaha Genesis engine. The carburetors have been replaced with electronic fuel injection (no choke!) The EFI provides excellent power delivery with an absence of flat spots at any altitude, and gas mileage of about 47 mpg, or about 4.5 liters / 100 km. Milder camshafts and lower compression ratio have replaced the FZR's high end horsepower with real world grunt. 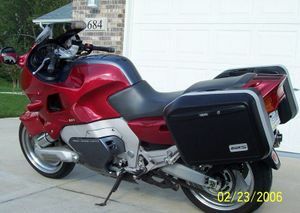 (98 horsepower at 7500 rpm; 68 ft-lbs of torque at 6800 rpm. The GTS accelerates from 0 to 60 in about 3.3 seconds. (40-60 mph & 60-80 mph, 3.7 and 3.8 seconds respectively) and can turn 11.7's in the quarter mile at about 115 mph. This unit uses regular gas. 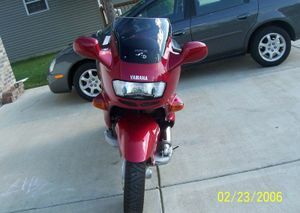 It was one of the most advanced motorcycles of its day, and remains a showcase of Yamaha technology. This page was last edited on 10 December 2010, at 15:57.